Your landscape should be a reflection of your abode and your locale. That’s especially true here on Cape Cod. Homes throughout the area embrace and usually feature warm, inviting materials; simple, elegant colors; and a well-maintained landscape to connect all of the features of the home’s facade. Here at Cape Cod Lawn Care, we understand the urge to build and landscape in the traditional Cape Cod style, and that’s why we specialize in Cape Cod-style landscaping design. We’ll work with you to develop the ideal design for your landscape; we’ll select plants that thrive here on Cape Cod, and we’ll design your landscape to fit your home. There are plenty of other plants that are ideal for Cape Cod homes. We often recommend a flurry of dark greens in the flora around your landscape, as well as a few bursts of color accenting your property. We’ll work with you to determine our plant palette for your landscape. Oftentimes, we’ll strive to stick with the Cape Cod theme that you’ll see across the Cape. We utilize small shrubs and bushes near the home, and larger trees in the yard (It’s wise to keep trees far away from the home, since they can cause damage in a temperamental storm. We use flowers to accent the planters throughout your property. We also use edging and hardscaping to keep the lines of your landscape clean and tight. We can also incorporate landscape lighting to make your landscape glow. We’ll work with you to build the perfect landscape to suit your Cape Cod home. 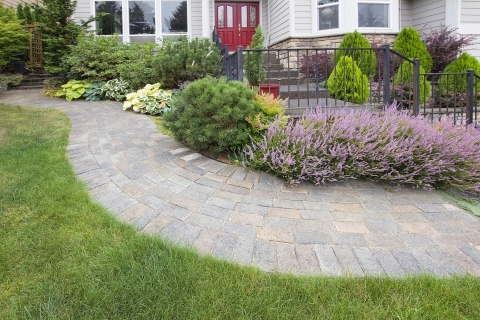 With Cape Cod Lawn Care, you receive premier landscaping services from start to finish. Actually, we’re never finished — we’ll help you with landscape design, implementation, and continual maintenance. It’s our goal to ensure that your property is always pristine. Get in touch with us for any and all of your landscaping needs.